In Basque Country author Marti Buckley takes you on a tour of the real food of the Basque homeland. These are the dishes of each mother and grandmother and the little restaurants that may be out of the way but worth a trip. Marti says that peppers, along with parsley, provide the most of the color in Basque cuisine. The Basque name for this dish is piperrada and it is ubiquitous: served by itself, atop salt cod, with a side of goat cheese, or with scrambled eggs. 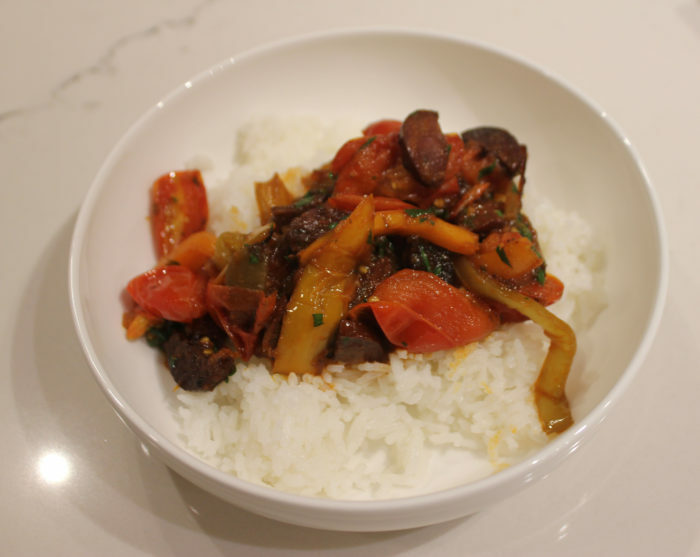 The Basque territory spreads over to France and there the dish is called piperade and is equally diverse in its use. There is a trick to this dish: time. 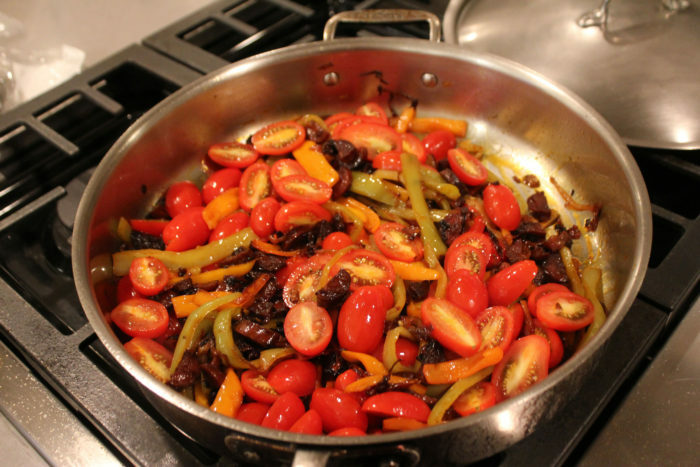 Allow the onions and peppers to cook long enough to caramelize. The flavor will be enhanced considerably. And, Marti notes, if you just happened to have some duck fat hanging around, use that instead of olive oil. It makes a difference. And for our serving? Rice. Lovely, fluffy rice. Score the bottom of each tomato with an X and place them in the boiling water. Cook for 2 minutes, then drain and run under cold water. Peel the tomatoes (the skin should come off easily). Discard the skin and seeds, then finely dice the flesh. Set aside in a bowl. In a large skillet, heat 2 tablespoons of the olive oil over medium-high heat. Add the garlic, and when it starts to “dance” and change color slightly, add the onions and a pinch of salt. Lower the heat to medium and cook, stirring, until the onions begin to caramelize, 15 to 20 minutes. Add the red and green peppers, a pinch of salt, and if the mixture is looking dry, the remaining 1 tablespoon olive oil. Cook, stirring, until the vegetables are fully tender and the onions are caramelized, 15 to 20 minutes. Add the diced tomatoes to the mixture, along with any juices that they have released. If using the Espelette pepper, add it now. Cook until the mixture has a homogeneous, stewlike texture, 20 to 25 minutes. Taste and adjust the seasoning.